Nahid Sultana is currently a doctoral candidate in the school of Social Work at McGill University. She completed her MSW from the Faculty of Social Work at the University of Calgary. 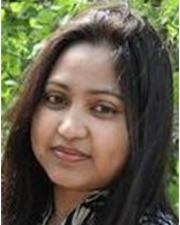 Nahid also has completed her M. Phil, MSS and BSS in Public Administration at the University of Rajshahi, Bangladesh. After completed her MPhil study, she has joined as a Lecturer in the Department of Public Administration at the same university. Prior to pursuing her doctoral studies Nahid worked as a research assistant at the Brenda Strafford Centre, Calgary which examines the effectiveness of volunteer program in the prevention of domestic violence and also worked in different projects at the Centre for Social Work Research and Professional Development of the Faculty of Social Work, University of Calgary. Nahid has work experience with the Centre for Affordable Water and Sanitation Technology (CAWST) which is an international agency working to provide safe drinking water and sanitation services around the world. Nahid is a member of the McGill Centre for Research on Children and Families (CRCF). She has published journal articles on IDA participants, comparison of Social Work practice between West and Bangladesh, NGOs for development, status of women, role of NGOs to increase awareness, women participation in local government and so on. Her research interests include poverty, immigrants, social welfare policy and NGOs in Development. Nahid is the recipient of SSHRC and FRQSC scholarships for her Doctoral research.